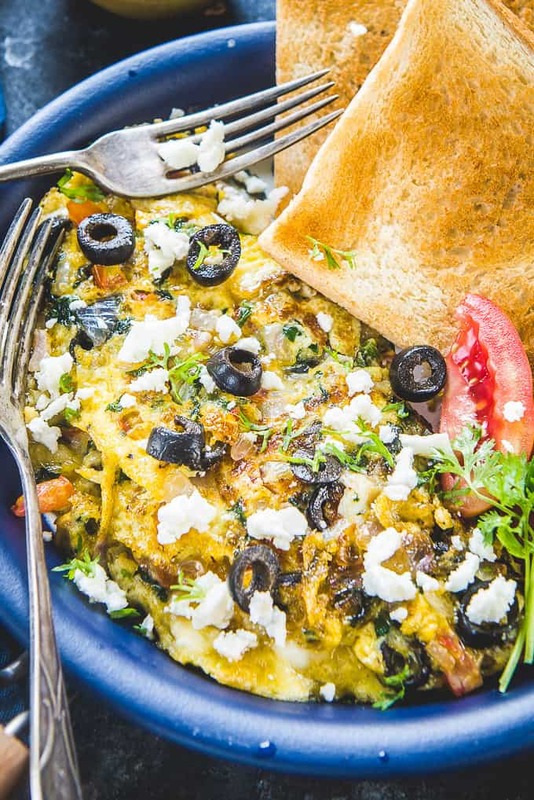 A classic Greek breakfast loaded with spinach and feta cheese, Greek Omelette suits perfectly for breakfast! Also, make it for quick brunch on a lazy weekend and enjoy the variety of its exotic flavours. Here is a step by step recipe of how to make Greek Omelette with Feta Cheese. Mostly, I serve crisp-tender omelette for weekday breakfast. Because, they are as healthy as Oats Banana Smoothie, Pumpkin Pie Pancakes. However, pairing herbs and veggies with egg mixture and feta cheese is a really good idea. And if you are up for it then get ready to gently fold this fluffy Greek Omelette for healthy brekkie every day, you guys! Now eggs are almost set on medium-high heat on a non-stick skillet but adding the right veggies and spinach mixture is the actual magic. All set to serve under 20 minutes, this Mediterranian omelette is a great way to serve eggs. Furthermore, like Greek Salad it is lip-smacking. You might feel that this snack would need fancy preparations. But, not at all. In fact, it gets done by taking some olive oil, sauteeing in veggies and pouring in the whisked eggs. That’s it. You do not need stirring frequently unlike when making Scrambled Eggs. The egg mixture does not need stirring frequently yet this omelette turns out fluffy and perked up. Though kefalotiri cheese is used for making the traditional Greek Omelet in Southern Greece, I found that even crumbled feta cheese works just fine. To make it more authentic, I have used kalamata olives. You may use the regular ones in case they ain’t available. Now, I do know that you might not have added mint to your omelette but for this one garnish it with fresh mint leaves and see the difference! Also, do use freshly cracked black pepper when you are making Greek Omelette. Trust me, it shall pep up its flavours all the more. 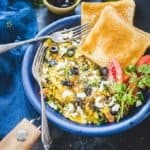 Now that this Greek Omelette Recipe is a hit in my house, I am planning to make other versions of Omelette like Japanese Omelette, French Omelette, Denver Omelette etc and see how the family likes them. How to make Greek Omelette Casserole? If you are serving this omelette to a crowd, Making it as a casserole is a more practical way without compromising on taste. You will be able to make a big batch with minimal effort and the taste profile will be exactly same as the individual portions. To make Greek Omelette casserole, mix all the ingredients in a bowl. Pour the mixture in a greased 8×8 square baking tray and bake in a preheated oven (375 Degrees f) for 30-35 minutes. Sprinkle feta cheese on top, cut into slices and serve hot. 8×8 inch tray will need a minimum of 8 eggs to bake into a nice square. So please keep that in mind. How to make Greek Omelette with Potatoes? To make Greek Omelette with Potatoes, peel and cut the potatoes in small cubes. Heat 1 tbsp olive oil in a pan. Add the potato cubes and fry until browned from all the sides. Whisk eggs, salt, pepper and feta cheese in a bowl. Add fried potatoes. Pour the mixture in an oiled pan and cook until egg is set and browned from both the sides. How to make baked Greek Omelette? To make baked Greek Omelette, pre heat the oven to 375 degrees F (180 Degrees C). Mix all the ingredients in a bowl and pour them in a greased baking tray. Bake for 10-12 minutes until the egg is set. Sprinkle feta cheese on top, cut in slices and serve. Heat olive oil in a non stick pan. Add spinach, olives, tomato and onion and fry for 2-3 minutes on medium heat. Whisk eggs, milk, salt and pepper in a medium bowl. Pour the egg mixture in the pan and allow uncooked eggs to flow over the spinach mixture. Sprinkle fresh mint and feta on top of the omelette. Gently fold the omelette in half. 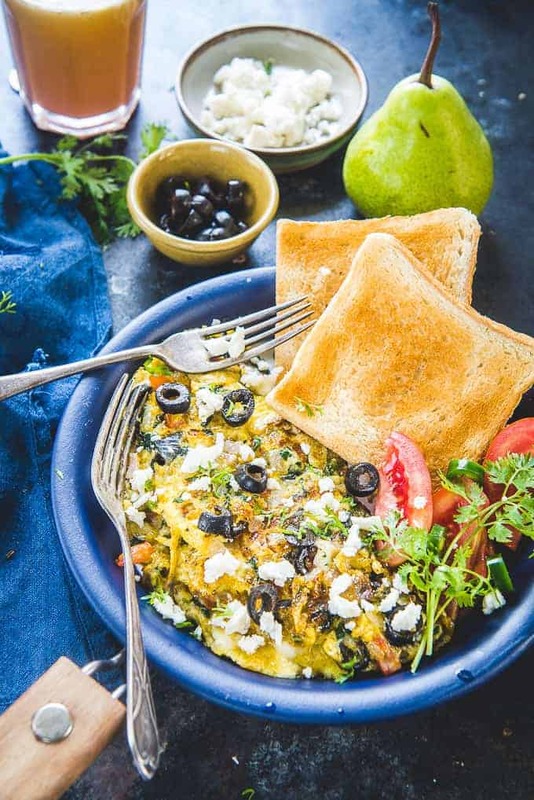 A classic Greek breakfast loaded with spinach and feta cheese, Greek Omelette suits perfectly for breakfast! Add spinach, olives, tomato and onion and fry for 2-3 minutes. Whisk eggs, milk, salt and pepper in a bowl. Pour the egg mixture in the pan. Cook until the egg is set from the base. Flip the omelette in half. Thanks for recipe. What kind of pan is that. Is it cast iron or anything else? Thnx. I cooked it in a non stick pan. For the picture, I served it in a terracotta pan.